Map of the Fifth Ward. Five candidates are challenging four-term incumbent Leslie Hairston for the position of Fifth Ward alderman in the February 24 election. An alderman serves a four-year term on the 50-member Chicago City Council and works on projects with other aldermen, the mayor, and community groups. 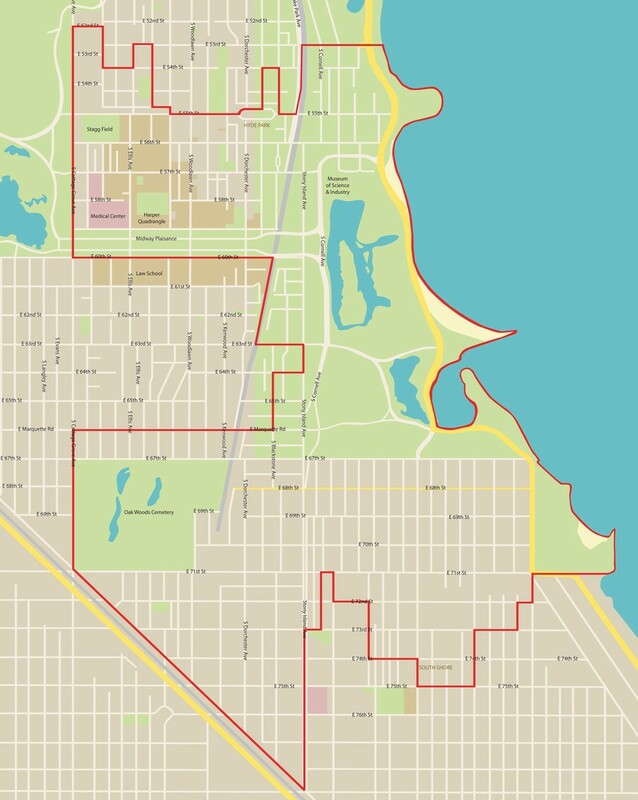 The Fifth Ward boundaries are roughly 79th Street to Hyde Park Boulevard, and Cottage Grove to the lakefront. It encompasses multiple distinct neighborhoods, including parts of Hyde Park and parts of the South Shore area. There have been three community meetings in this election cycle so far, in which candidates have communicated their positions to community members: one hosted in Hyde Park sponsored by the Coalition for Equitable Community Development, another in the South Shore hosted by the NAACP, and another hosted at ABJ Community Services in the South Shore. The candidates shared their concerns, ambitions, and criticisms at the meetings. Hairston was elected to the alderman’s office in 1999 after working as a lawyer for a private firm. Over her last two terms, Hairston said she has worked with business leaders to bring companies to the Fifth Ward, including one of the highest grossing Starbucks, K&G Fashion Superstore, and Jewel Osco Pharmacy. “The reason that I’m running for reelection is the same reason that I ran for election the first time—because I have a vision for our community, and that vision includes a vibrant business district, mixed-income housing, jobs, opportunities for growth, recreation, and economic development,” Hairston said. Her office is currently in negotiations to bring a new grocery store to the South Shore section of the Fifth Ward, which has been without a grocery store since the grocery chain Dominick’s left Chicago last year. However, community members present at the forum expressed concern over the quality of the new grocery store and questioned Hairston’s claim that the choice of the new grocery store actually reflected community input. At an earlier forum at the Coalition for Equitable Community Development (CECD), when asked about maintaining diversity in Hyde Park, Hairston commented that the University of Chicago serves as a mechanism for enhancing diversity in the area as a whole. Boyd-Clark is the owner of The Scentuary, a small aromatherapy business in the South Shore neighborhood, president of Clark Construction and Development Inc., and CEO of RC Investments, a property management firm. According to the magazine South Shore Current, Boyd-Clark’s highest priorities for the ward are economic development, creating jobs, opening a trauma center, and increasing the availability of healthy, affordable food available across the ward. She wants to review the process of qualifying a neighborhood for tax-increment financing (TIF) funds, tax-based area designations meant to provide funds to help underdeveloped areas, to make sure neighborhoods that need them actually get them. Other goals include implementing a small business fund, getting a historical designation for 71st Street, and helping the South Shore better utilize its TIF funding. Miles, a lawyer, has volunteered for the Office of the State Appellate Defender to help expunge and seal criminal records in order to give felons a second chance. Her aldermanic priorities include the development of Stony Island Avenue, reforming the criminal justice system, using eminent domain for the purposes of attracting a new grocery store, and utilizing TIF funds. Miles particularly wants to focus on the development of Stony Island Avenue, which she claims has special potential because of the amount of car traffic it gets per day. According to Miles, this development would spread to the rest of the community. An ordained pastor and the president of the Young Leaders Alliance, Brown’s highest priorities for the Fifth Ward are public safety, bringing a quality grocery store to the South Shore, beautifying empty lots, and making the TIF system more transparent. Brown criticized Hairston for her handling of the grocery store issue and argued that the controversy represents a larger problem in the Fifth Ward. “That is a vehicle of a continuing problem...that we keep losing things in our neighborhood and other people think that they can come and bully us around. But it’s time for us to get representation and understanding, not to be a dictator but to be a representative and to let the community be at the table,” he said. Brooks is an attorney at Urban Partnership Bank and an adjunct professor at Northeastern Illinois University’s Carruthers Center for Inner City Studies. Her goals for the Fifth Ward are greater transparency and restrictions on the University of Chicago Police Department, restoring the South Shore as a cultural hub, and showcasing Hyde Park’s economic development. “Hyde Park has become our new go-to for shopping, working, and dining. We will continue to collaborate through public and private partnerships that will allow the neighborhood to continue to thrive,” Brooks’ website said. Jocelyn Hare is a University of Chicago Harris School of Public Policy graduate and is currently working as a policy advisor to Karen Freeman-Wilson, mayor of Gary, IN. Hare wants to pursue creating an elective school board, bringing a trauma center to the South Side, and exploring the idea of bringing pop up stores to the South Shore while more research is done on deciding the best place to put in a new grocery store. “With the development of Whole Foods, and with potential developments of the Obama library, and also with investments in Jackson Park, housing prices are going to up,” Hare said at the first aldermanic forum. Corrections: A previous version of this article incorrectly stated that the election for the Fifth Ward alderman would be held on February 25. The election will be held on February 24. The article also misspelled the name of Jocelyn Hare. The Chicago Maroon regrets the error.